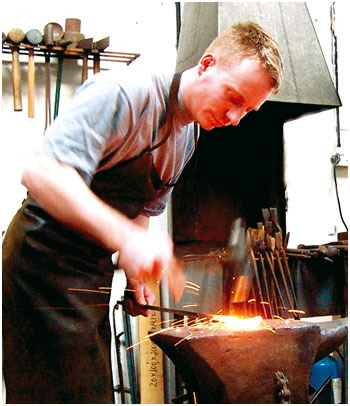 Christopher Manley has 17 years experience in Blacksmithing and traditional ironwork. After training at Hereford he then went on to work for one of the top Blacksmiths in Bath for eight years, before setting up his own business. Anvil Art can provide you with quality products with that personal touch, using his wide experience in restoration techniques and the manufacturing of items produced in wrought iron. Anvil Art has also been involved in the manufacturing of historical reproduction of domestic iron work.